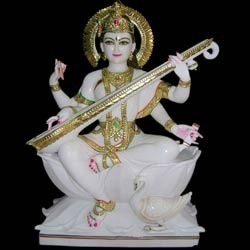 We are one of the well known designers and manufacturers of a finest range of Goddess Saraswati Sculptures. This range is designed by our expert artisans and beautifully depicts minute details of the goddess. The range is available in varied sizes at attractive prices. We are engaged in offering a unique collection of Saraswati Sculpture (with dove). The array is carved in finest quality marble and comes with stunning sheen and elegance. Our artists make use of several beautiful colors like pink, golden, green, blue, red and silver, to paint this range. The collection is available varied designs, color combinations and sizes to meet the diverse requirements of our clients. 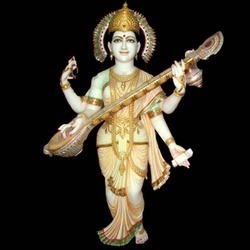 We are also involved in offering an exquisite collection of Saraswati Sculpture With Veena in one hand. The goddess Saraswati is regarded as the deity of the studies and knowledge. Every art form or music, art, studies are associated with her blessings. Our team of artisans crafts this beautiful Goddess Sculpture, with intricate features. These sculptures are made from quality marble stone and other associated raw materials. We offer this collection at very affordable prices for our clients. 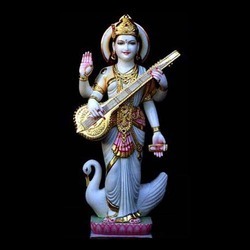 Looking for Goddess Saraswati Sculptures ?